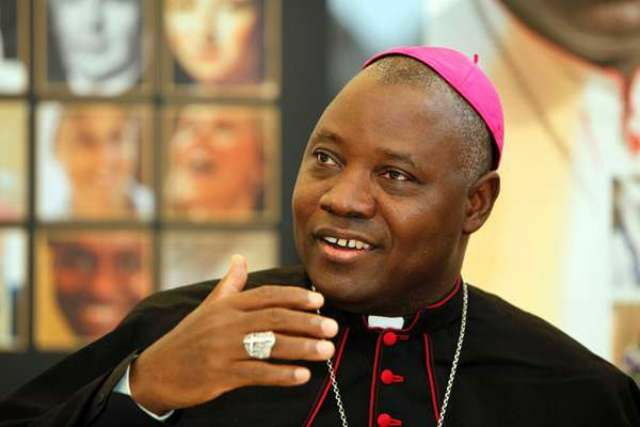 The Catholic Bishops Conference of Nigeria (CBCN) has called on President Muhammadu Buhari to use his background as a farmer and cattle rearer to find a `civilized solution’ to farmers/herdsmen clashes across the country. The President of CBCN, Rev. Ignatius Kaigama, made the call on Thursday after a closed doors meeting with Buhari at the Presidential Villa, Abuja. He frowned at the reported killing of innocent citizens in different communities across the nation and their sources of livelihood mindlessly destroyed. “We feel there should be a solution, a very civilized and enlightened solution. What we have is not working and people are dying in different parts of Nigeria, North, East, West, South wherever and something has to be done. “We believe our President can do something. Apart from being our President, he has the interest of security of Nigerians and he also has some affinity with those herdsmen who graze and rear their cattle and so on. I believe he is also a farmer. “So he can combine the two interests (in rearing and farming), and come up with a solution that will be fair and all the different groups will feel they belong and they are being adequately assisted to do what is right to avoid killings and destruction of lives and property. `Our President can do it,’’ he said. Kaigama, who is also the Archbishop of Jos, decried the recent massacre of unarmed citizens by these terrorists in some communities in Benue, Adamawa, Kaduna and Taraba States. On proposed cattle colony by the Federal Government, the Archbishop advised the ministry to look for better alternative to creation of the colonies. Kaigama reiterated the determination of the Catholic Church to complement the efforts of government in providing quality education and primary health care services to Nigerians. “Our Church has always complemented the efforts of government in such areas as providing quality education and primary health care services to our people. “We continue to make our contribution to nation-building through our prayers, admonitions and assistance to needy Nigerians whenever we can.